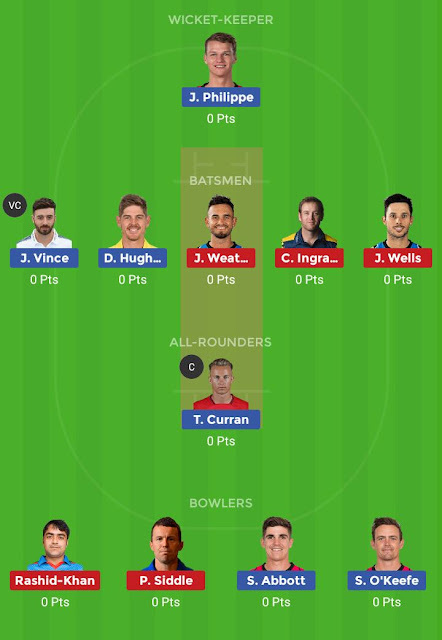 SDS vs ADS, 45th Match, Big Bash League 2018-19. Both team declared their 13 player squad for the match. In Adelaide Strikers squad Peter Siddle replaces Wes Agar. Colin Ingram (c), Rashid Khan, Jake Lehmann, Michael Neser, Matthew Short, Cameron Valente, Jake Weatherald, Jon Wells, Billy Stanlake, Liam O’Connor, Ben Laughlin, Alex Carey, Peter Siddle. Josh Philippe (wk), Dan Hughes, James Vince, Moises Henriques (c), Jordan Silk, Tom Curran, Sean Abbott, Steve O’Keefe, Ben Dwarshuis, Lloyd Pope, Ben Manenti. Alex Carey (wk), Jake Weatherald, Jake Lehmann, Colin Ingram (c), Jon Wells, Rashid Khan, Michael Neser, Peter Siddle, Ben Laughlin, Billy Stanlake, Liam O’Connor/M Short. 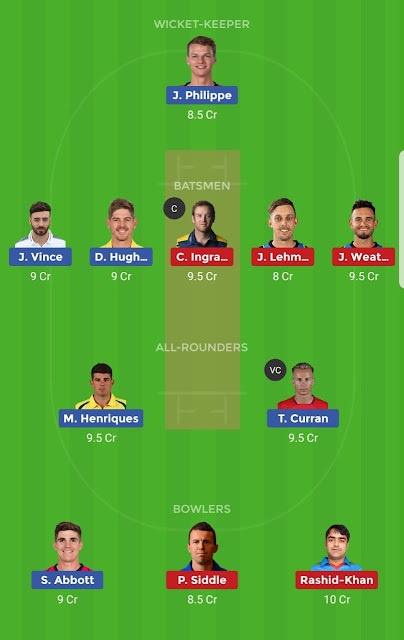 Team 2: If you are with more than 1 team then you can go with below team.